As you well know, your baby's skin is incredibly delicate, making it extra sensitive and likely to burn: "Babies should be in the sun as little as possible," says Laura Calili, M.D., pediatrician with Riley Hospital for Children at Indiana University Health. Plus, babies aren't great at regulating their internal temperatures because their nervous systems aren't fully developed yet, which means they can overheat easily, says Dr. Calili. Unfortunately, staying indoors 24/7 isn't the most realistic of UV protection plans. 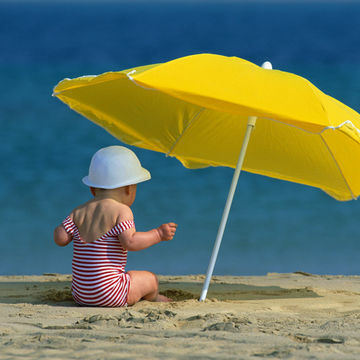 Instead, follow these tips to keep your baby safe in the sun. When it comes to sun protection, sunscreen is usually the first thing that comes to mind (and with good reason!). But for babies, it's a last resort. "Sunscreen isn't generally recommended for babies under six-months-old," says Dr. Calili. Babies' sensitive skin makes them more likely than adults to have irritations and allergic reactions, adds Sonya Lunder, MPH, senior analyst with the Environmental Working Group. If sunscreen is typically a no-no, how do you protect your baby? Stroller covers and umbrellas are a definite must. 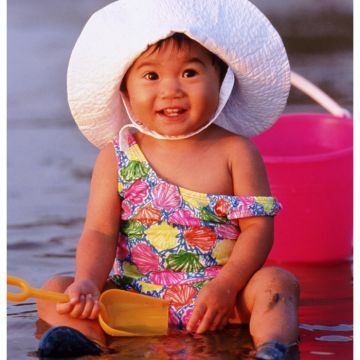 If you plan on spending long hours outside, dress your baby in special UPF (ultraviolet protection factor) clothing that fully covers the arms and legs, says Dr. Calili. These are typically more breathable, wicking, and have a higher UPF than your run-of-the-mill baby clothes. (Your average white T-shirt, for instance, only has a UPF of 5, according to the Skin Cancer Foundation.) Top it off with a wide-brimmed hat. Unfortunately, no matter how breathable your baby's clothes claim to be, some heat is going to get trapped under those layers, says Dr. Calili, who recommends taking your baby inside frequently for air conditioning breaks and avoiding going outside during the hottest hours of the day (10 am to 2 pm), when UV rays are strongest. "If it's impossible to keep your baby covered or shaded, use a small amount of a zinc oxide- or titanium oxide-based sunscreen," says Lunder. These physical blockers don't penetrate babies' absorbent skin, she says. Opt for an SPF 50 broad-spectrum lotion specifically made for babies, and beware of any formulas that contain oxybenzone or retinols, both of which can be absorbed by the skin and potentially reach the bloodstream. The combination of sun and heat can be super dehydrating. So if you're in the sun for more than a few minutes, you should give your baby formula or breast milk—and always store the liquids in a cooler, says Dr. Calili. Pay attention to how much and often your baby urinates. If it's less than usual, you may need to up the fluids. Your baby can't say, "Hey, mom. I'm hot and burnt. " So keep an eye and ear out for any redness, splotches, or fussy behavior. It all means it's time to go inside, says Dr. Calili.